Rafaela De Silva has an art gallery to run, a sprawling piece of family property with back taxes due, and a younger sister to care for who suffers from anorexia. She doesn’t have time for broken shoe laces, sprained ankles or tumbling into the arms of a handsome stranger, especially one whose past involves scandal. Brett’s determined to help the beautiful runner he rescues from a fall. After examining the smooth edges of her broken shoelace, he’s convinced her accident wasn’t accidental. But if he’s going to help her, he’ll have to convince her to trust him…a difficult task given his past. Brett Fraser couldn’t move his neck. He’d caught a few hours’ sleep hunkered into the crevice between his car seat and the door. His right hand throbbed with tiny needles as the circulation came back, and his knee, wrapped around the gearshift, wouldn’t unbend even after he sat up. As soon as I get off this back road and locate Santa Fe, I’m going to find a nice hotel, a shower and a king-sized bed. Sleeping in his car had definitely lost its charm. After six months of a self-imposed sabbatical touring the great Southwest, he was ready for some creature comforts. One thing for sure, he’d seen some spectacular country. The Grand Canyon with its sheer drop-offs and hidden valleys. Lake Powell’s amazing mixture of colors—blue, green and a thousand variations of rust. Canyon de Chelly, the Navajos’ sacred place, with its smooth, sheer walls of swirling sandstone and cliff dwellings. Absolutely unbelievable. He might not know where or how he fit into it, but one thing was clear, God had a plan. Anyone who’d witnessed these spectacular sights had to recognize the Master Artist at work. Case in point: the sunrise in front of him. In Arizona, fire burned the skies during sunrise and sunset. Bright golden light and fireballs of orange and gold lit the horizon. But here, in New Mexico, the colors were softer, more subtle. Above the dark ridge, the horizon was streaked as if by a paintbrush with bands of subtle gray blending into purple, then mauve, and finally pink. Brett sat up straighter, peering closely. A head appeared behind the ridge, coming over. When the runner reached the top, she turned and ran along the slender path with a smooth stride. A long ponytail swung behind her, giving her a graceful rhythm, almost like a dancer swaying from side to side. 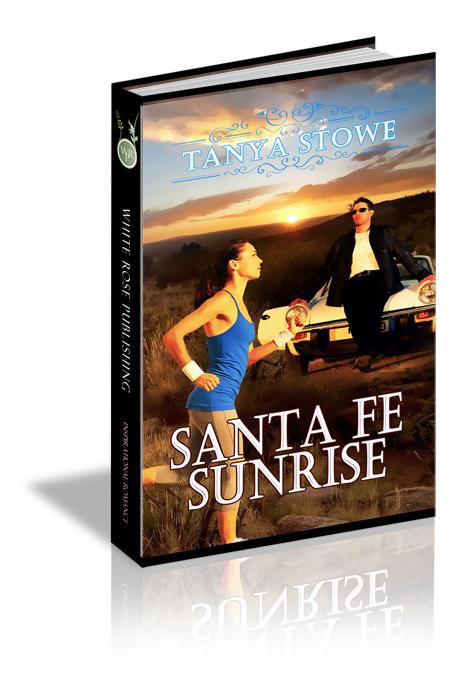 Completely shadowed with the pastel sunrise behind, her curvy figure stood out in dark relief. “Come on, come on.” The password lock took forever, and the camera even longer to open. At last he had the lens focused on the woman. He watched the mesmerizing rhythm of her movements, waiting for just the right moment. Suddenly, the runner stumbled and disappeared from the lens. Brett lowered the phone just in time to see a dark running suit rolling down the sand-colored hill. He threw his cell to the seat and bolted from the car, leaving the door open and the keys in the ignition. As he skidded down the gravel side of the road, his car set up an outraged beep. Ignoring the incessant sound, he leapt over a small tumbleweed and kept running. Brett topped a small rise. The runner sat at the bottom of a culvert just below the ridge. One dark running shoe lay off to the side, and the woman was bent over, gripping her right ankle. The injured woman screamed and nearly bounced off the ground. “Where in the world did you come from?” Her voice was low and a bit husky…a bedroom kind of voice. Her chin nudged up. “That’s what I call that ridge. It’s narrow and has drop offs on both sides. Sometimes, when the wind blows, it feels as if I’m crossing a swaying rope bridge. I run over it every day and never had a problem…until this.” She pushed the shoe further away. Brett picked it up and examined the broken lace’s smooth edges. Something about it bothered him but at that moment, the lovely runner gave a soft moan and rocked over her injured ankle again. She nodded, her teeth clenched in pain. She nodded and Brett grasped her upper arms. She got her good leg beneath her and stood to her full height with surprising speed, considering her injury. On the ridge she’d seemed much taller but in reality, she couldn’t have been more two or three inches over five feet. Up close, her olive skin was pale and had a soft sheen—not from running, but pain. Full pink lips were clenched tight, and when she leaned into Brett for better balance, something sweet and exotic wafted up from her black hair. Get a grip, Fraser. She’s in pain. That didn’t stop him from wishing she’d look up so he could see the color of her eyes. But a little moan of pain banished even that thought from his mind. He gripped her arms to steady her. “OK.” A near whimper. But the woman was a trooper. After just a few minutes she nodded. She nodded again and Brett started up the hill. Her petite frame couldn’t match his five-eleven one, so he ended up carrying her most of the way up. At the top, he had to pause and catch his breath before making their way down the other side. Half an hour later, they finally reached the road. Brett climbed the gravel side of the highway with his limp, exhausted runner cradled in his arms and set her on the dust-covered fender of his car. She leaned to her side, trying to pull her ankle up. Brett bent over to stretch his taut back muscles. “My best friend was in a car crash. I helped out with the recuperation therapy.” Straightening, he opened the passenger door. The scent of old French fries wafted out along with other stale odors. The injured woman looked at the hardened fries scattered across the seat, then leaned forward, openly gaping at his clothes, thrown helter-skelter over the back. Brett chuckled. “Good idea. Call her and let her know a man named Brett Fraser will be taking you to the doctor in a sports car.” He recited the license plate and model of his car. A solid ball of disappointment slid straight down Brett’s throat and settled in his stomach. “Ex-director. I’m the ex-director.” He pulled her shoe out of his pocket and tossed it to the back. “Not the headlines.” She looked up and directly into his eyes. Brown. Her eyes were the darkest, richest chocolate he’d ever seen. Rimmed with long black lashes, they rivaled anything he’d viewed in a painting. Figured. Even her name was exotic and beautiful.